(Bloomberg) -- As the race to fifth-generation wireless technology heats up, so do the claims about technological superiority. 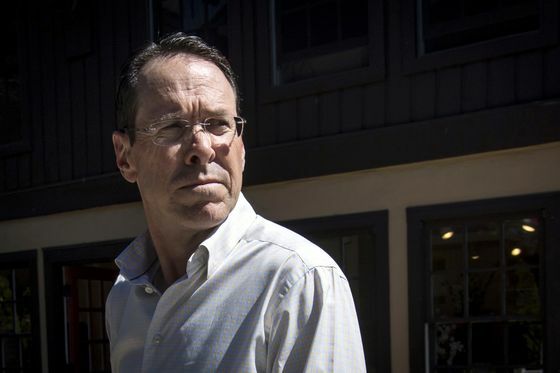 A day after Verizon Communications Inc. announced that it will be the first carrier out of the gate to launch 5G wireless in the U.S., AT&T Inc. Chief Executive Officer Randall Stephenson said he’s curious to see how the service will be greeted by consumers. “I think even Verizon is wondering how this will be received,” Stephenson said in an interview after his appearance at the Goldman Sachs Communacopia conference in New York Wednesday. Verizon will use high-frequency signals to beam broadband to select homes in Los Angeles, Houston and Indianapolis, and Sacramento, California, starting Oct. 1. The speeds will range up to 1 gigabit a second, with monthly prices starting at $50. But there’s a caveat: To get the service to market first, Verizon is using nonstandard 5G gear in its initial rollout. The company says it will used standardized equipment when it is available. The initial service also is aimed at household users, rather than mobile customers. AT&T, based in Dallas, aims to bring 5G to its hometown and five other cities: Atlanta, Oklahoma City, the North Carolina cities of Charlotte and Raleigh, and Waco, Texas. It plans to reach the markets by the end of the year using standards-based equipment. The service will initially connect to 5G “pucks” or hot-spot devices, which could be moved around. The tussle between AT&T and Verizon underscores the urgency to get ahead in 5G, which is seen as a driver of growth for the wireless industry. Companies throughout the supply chain are expected to spend an estimated $200 billion on 5G efforts, and the Trump administration has billed it a national priority as China expands its 5G capabilities. Stephenson downplayed reports that China was ahead of the U.S. in 5G development during a presentation to investors Wednesday. China has “trials” in progress, while U.S. wireless carriers are actively deploying commercial 5G services this year, he said.